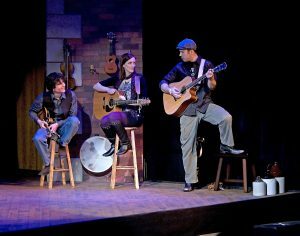 The cast of “The Irish … and How They Got That Way,” On stage until June 4 at Delaware Valley University. It is a production of the new Bucks County Center for the Performing Arts. The show, “The Irish … and How They Got That Way” is an exceptionally entertaining musical history lesson. “That was simply marvelous!” an actor friend, Joe, exclaimed. “I marvel at the incredible talent of this cast!” exclaimed another theatre acquaintance after the performance. “I learned more tonight about European history than I’ve learned in my AP European history class,” said a rising senior from a nearby high school. “And it was so much fun and thoroughly entertaining,” she added. These friends and many more people had just enjoyed an evening seeing a musical presented by the brand-new Bucks County Center For The Performing Arts (BCCPA) under the leadership of longtime Carversville resident, producer Howard Perloff who has produced shows across the country. In this musical, three women and three men sing, act, dance, and play multiple instruments. Part of the fun is watching them alternately playing one of more than 20 instruments including a piano, various strings, flute, different types of drums, and other percussion instruments. But it’s not just instruments, it is also our heart strings they play as they orate and sing the stories of the trials, poverty and famine the Irish people experienced and why so many of them immigrated to America where they impacted American culture. To be sure, they proudly point to their influential descendants, including John F. Kennedy and many others. But, it isn’t just the music that makes this production so much fun, it is the always varied, always interesting pictures that director Danielle Paccione has created. The six performers move around constantly. Each picture is different and delightful, with dancing designed by choreographer Maria Logan. The icing for me on this Irish cake was learning that another friend, Lewis, also seeing the show last Saturday evening was once an English student of the playwright at Brooklyn’s Stuyvesant High School. Lewis told me every class with Frank McCourt was fascinating. McCourt suffered greatly as a child in Limerick, Ireland, but was one of the Irish who found success in America becoming not just a teacher but also the acclaimed author of “Angela’s Ashes,” which tells of his horrible existence in Ireland as a child. I encourage you to search Frank McCourt on the Internet. At the musical’s conclusion, the audience members jumped to their feet to demonstrate their enthusiastic appreciation. Who are these six extraordinarily talented performers? First lass is Meredith Beck, a Bucks County native with a degree in theatre and vast experience. She will play in all three musicals this summer. Next is Janice Landry who has been part of the Galway Girls founded by Beck, and has toured with the Tokyo Philharmonic Orchestra as a singer. Caitlin Sheridan McKechney, with her rich voice, often stars in opera productions and is a member of the Opera Cowgirls band. The three terrific lads are tenor Brandon Lambert, a true Irishman, Martin Landry, the tallest troupe member, primary pianist and husband of Janice, and charmingly handsome Alexander Sovronsky who plays even more instruments, he told me, than we see him play on stage. “The Irish” continues today through Sunday matinee, June 4, in the theatre of the Life Science Building on the campus of Delaware Valley University, Route 202 (700 E. Butler Ave.) in Doylestown, just west of Doylestown Hospital. Evening performances are June 2 and 3 at 8 p.m. Matinees at 2 p.m. are June 1, 2, 3 and 4. The next production opens June 28 with “Give My Regards to Broadway,” by George M. Cohan, a rousing patriotic musical perfect for the July 4th weekend and beyond. Go to BucksCountyCPA.org for ticket and seating information or call 215-297-8540.